Georgia holds a BSc Podiatry honors degree from the University of Brighton in the UK. She is a former President of the Cyprus Association of Registered Podiatrists and the Clinical Director for Special Olympics’ Fit Feet in Cyprus. She is a member of several NGOs and an active volunteer since her teenage years. During her studies, she practised Podiatry at the University owned Leaf Hospital in Eastbourne and at local NHS trusts. Georgia often takes part in health-related awareness events such, public talks and free screenings to inform people about common foot-related problems and promote the Podiatry profession. 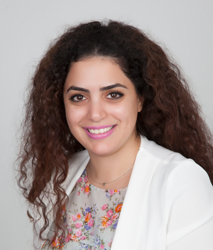 She is registered with the Cyprus Association of Registered Podiatrists and The Society of Chiropodists and Podiatrists (UK) and is a holder of a BLS/AED diploma. Georgia runs her own practice in Larnaka and is an associate Podiatrist at other clinics and medical centres. Podiatry is a field of medicine devoted to the study of the lower limb. Podiatrists can assess, diagnose and treat a range of foot problems and work closely with other health care professionals to achieve the best possible patient care.